Coming from Columbus: Pick up 23 South to Chillicothe then 35 east. The camp is located approximately 5 miles off US Route 35. If you are approaching from the west (via Chillicothe) exit left onto Elam Road. After 1 = miles, turn left onto Boy Scout Road. After traveling 2 = miles on Boy Scout Road, turn left onto John W. Barbee Road. From there, it is 1.2 miles to a hairpin turn to the right. From there you are on the gravel camp road. This road which descends into the valley offers beautiful scenery, but it is extremely narrow and should be traveled with caution. It is 1 = miles from the hairpin to the camp gateway. 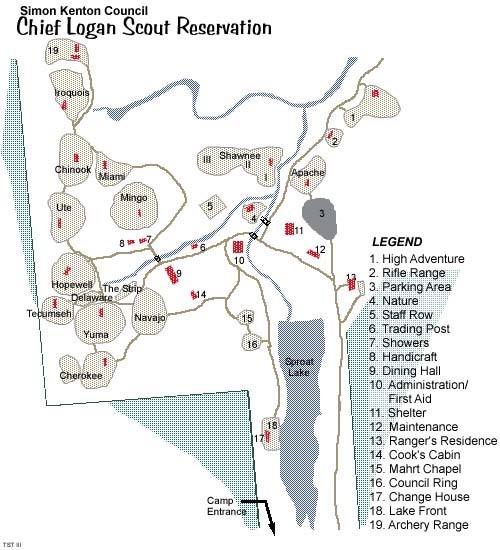 (Map to Camp) Directions from Columbus, Ohio to Chief Logan Scout Reservations.